Triangles ABC and DEF are similar. (i) If area of (ΔABC) = 16 cm2, area (ΔDEF) = 25 cm2 and BC = 2.3 cm, find EF. (ii) If area (ΔABC) = 9 cm2, area (ΔDEF) = 64 cm2 and DE = 5.1 cm, find AB. (iii) If AC = 19 cm and DF = 8 cm, find the ratio of the area of two triangles. 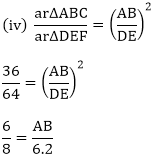 (iv) If area of (ΔABC) = 36 cm2, area (ΔDEF) = 64 cm2 and DE = 6.2 cm, find AB. (v) If AB = 1.2 cm and DE = 1.4 cm, find the ratio of the area of two triangles. (i) We know that the ratio of areas of two similar triangles is equal to the ratio of squares of their corresponding sides. In the fig 4.178, ΔACB is similar to ΔAPQ. If BC = 10 cm, PQ = 5 cm, BA = 6.5 cm, AP = 2.8 cm, find CA and AQ. 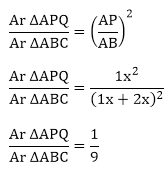 Also, find the Area of ΔACB: Area of ΔAPQ. (2) We know that the ratio of areas of two similar triangles is equal to the ratio of squares of their corresponding sides. The areas of two similar triangles are 81 cm² and 49 cm² respectively. Find the ration of their corresponding heights. What is the ratio of their corresponding medians? Given: The area of two similar triangles is 81cm2 and 49cm2 respectively. (1) The ratio of their corresponding heights. (2) The ratio of their corresponding medians. (1) We know that the ratio of areas of two similar triangles is equal to the ratio of squares of their corresponding altitudes. (2) We know that the ratio of areas of two similar triangles is equal to the ratio of squares of their medians. The areas of two similar triangles are 169 cm2 and 121 cm2 respectively. If the longest side of the larger triangle is 26 cm, find the longest side of the smaller triangle. The area of two similar triangles is 169 cm2 and 121 cm2 respectively. The longest side of the larger triangle is 26 cm. We know that the ratio of areas of two similar triangles is equal to the ratio of squares of their corresponding sides. Hence, the longest side of the smaller triangle is 22 cm. The area of two similar triangles is 25 cm2 and 36 cm2 respectively. If the altitude of first triangle 2.4 cm. We know that the ratio of areas of two similar triangles is equal to the ratio of squares of their corresponding altitudes. Hence, the corresponding altitude of the other is 2.88 cm. ABC is a triangle in which ∠A = 90°, AN⊥BC, BC = 12 cm and AC = 5 cm. Find the ratio of the areas of ΔANC and ΔABC. The corresponding altitudes of two similar triangles are 6 cm and 9 cm respectively. Hence, the ratio of the areas of two triangles is 4: 9. ABC is a triangle in which ∠A°, AN ⊥ BC, BC = 12 cm and AC = 5 cm. Find the ratio of the areas of ΔANC and ΔABC. 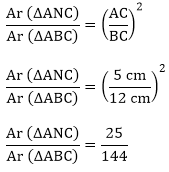 In ΔABC, ∠A = 90°, AN⊥BC, BC = 12 cm and AC = 5 cm. Ratio of the triangles ΔANC and ΔABC. (i) If DE = 4 m, BC = 6 cm and Area (Δ ADE) = 16 cm2 (Δ ADE) = 16 cm2, find the area of ΔABC. (ii) If DE = 4 cm, BC = 8 cm and Area (Δ ADE) = 25 cm2 (Δ ADE) = 25 cm2, find the area of ΔABC. Calculate the ratio of the areas of Δ ADE and the trapezium BCED. In the given figure, we have DE ∥ BC. (ii) We know that the ratio of areas of two similar triangles is equal to the ratio of squares of their corresponding sides. In ΔABC, D and E are the mid- points of AB and AC respectively. Find the ratio of the areas ΔADE and ΔABC. In ΔABC, D and E are the midpoints of AB and AC respectively. It is given that D and E are the midpoints of AB and AC respectively. We know that the ratio of areas of two similar triangles is equal to the ratio of square of their corresponding sides. The areas of two similar triangles are 100 cm2 and 49 cm2 respectively. 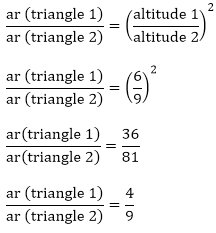 If the altitude of the bigger triangles is 5 cm, find the corresponding altitude of the other. We know that the ratio of the areas of the two similar triangles is equal to the ratio of squares of their corresponding altitudes. The areas of two similar triangles are 121 cm2 and 64 cm2 respectively. If the median of the first triangle is 12.1 cm, find the corresponding median of the other. 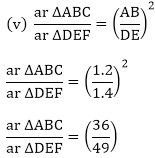 If ΔABC ∼ ΔDEF such that AB = 5cm, area (ΔABC) = 20 cm2 and area (ΔDEF) = 45 cm2, determine DE. We know that the ratio of the areas of the two similar triangles is equal to the ratio of the squares of their corresponding sides. In ΔABC, PQ is a line segment intersecting AB at P and AC at Q such that PQ ∥ BC and PQ divides ΔABC into two parts equal in area. Find BP/AB. We know that the ratio of the areas of the two similar triangles is used and is equal to the ratio of their squares of the corresponding sides. 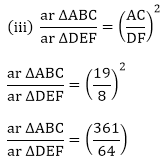 The areas of two similar triangles ABC and PQR are in the ratio 9: 16. If BC = 4.5 cm, find the length of QR. ABC is a triangle and PQ is a straight line meeting AB and P and AC in Q. 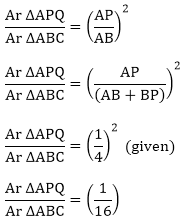 If AP = 1 cm, PB = 3 cm, AQ = 1.5 cm, QC = 4.5 m, prove that area of ΔAPQ is one – sixteenth of the area of ΔABC. According to converse of basic proportional theorem if a line divides any two sides of a triangle in the same ratio, then the line must be parallel to the third side. If D is a point on the side AB of ΔABC such that AD: DB = 3 : 2 and E is a point on BC such that DE || AC. 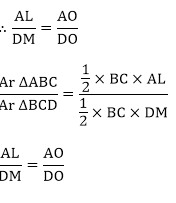 Find the ratio of areas of ΔABC and ΔBDE. If ΔABC and ΔBDE are equilateral triangles, where D is the midpoint of BC, find the ratio of areas of  ΔABC and  ΔBDE. Given In ΔABC, ΔBDE are equilateral triangles. D is the point of BC. We know that the ratio of the areas of the two similar triangles is equal to the ratio of squares of their corresponding sides. Two isosceles triangles have equal vertical angles and their areas are in the ratio 36: 25. Find the ratio of their corresponding heights. Two isosceles triangles have equal vertical angles and their areas are in the ratio of 36: 25. Suppose  ΔABC and  ΔPQR are two isosceles triangles with ∠A = ∠P. Let AD and PS be the altitudes of ΔABC and ΔPQR, respectively. Hence, the ratio of their corresponding heights is 6: 5. 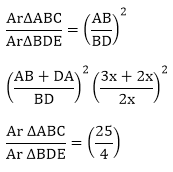 Given ΔABC and ΔDBC are on the same BC. AD and BC intersect at O. The diagonals AC and BD intersect at o.
a) We know that the ratio of areas of two triangles is equal to the ratio of squares of their corresponding sides. b) We know that the ratio of two similar triangles is equal to the ratio of their corresponding sides. In  ΔABC, P divides the side AB such that AP:PB = 1 : 2. Q is a point in AC such that PQ || BC. Find the ratio of the areas of ΔAPQ and trapezium BPQC. To find : The ratio of the areas of  ΔAPQ and the trapezium BPQC. We know that the ratio of areas of the two similar triangles is equal to the ratio of the squares of their corresponding sides.